Having seen 1380 minutes of football and an intense rugby match this season, the pitch at Gerland is getting a welcome overhaul. In their devastating European tour, the All-Blacks tore the pitch up, leaving tattered remnants behind them for Coupet and his mates. The field at Gerland suffered a lot from matches, the heat and the climate. Kidnapped by OL fans in quest of a souvenir to celebrate another title, battered and bruised after concerts, the pitch was showing signs of severe wear and tear, making the job tougher for the Autumn Champions of 2006 and almost playing a main role in the last game of the year by dishing Coupet up a nasty rebound. Gérard Houllier asked for a new pitch before the holidays and the City of Lyon put it into effect. "After several analyses with Thierry Braillard, OIC Sports for the City of Lyon, we realised that despite the work of the groundsmen, the pitch was giving way," said Jean–Yves Delorme (Commercial Director, ‘Park and Sport’), in charge of the laying of the new pitch before adding, "we noticed that the pitch was getting pretty tatty at the end of each game. the cause? It's one of the only pitches in Ligue 1 that hasn't been changed since the stadium was built. There was only one modification, in 1984, for the European Championships. This weekend we will lay turf from Portugal that has a very interesting density. This will allow OL to stay at the top of its game in the best imaginable conditions." So OL will next week be equipped with a tool befitting its ambitions. A "carpet" laid at just the right time, considering the battles the club will wage on its surface in the coming months. 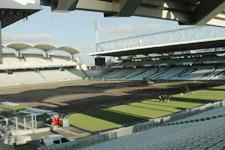 the pitch will be christened on 17 January when Le Mans comes to Gerland for the semi final of the Coupe de la Ligue.